Your faith will explode as you read Bartleman's challenging insights into faith-filled living from his experiences at Azusa Street. Then you will know how to be an instrument of God's love and healing to others, change your life from ordinary to extraordinary, conquer fears that have defeated you, experience the presence of God for yourself, and become as effective as the early Christians. Your prayer life will be unbelievably transformed as you experience God's moving in your life. 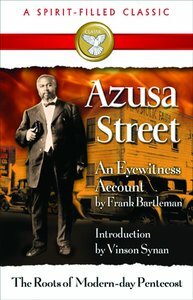 Customer Reviews For "Azusa Street"
This is an insider's look at how God was moving at Azusa Street and the challenges that came up at that time (often not what I expected the trials they'd face would be, a good wake up call). I learnt a lot about those times in history and I learnt more about our God who doesn't change and I am grateful that this book documents everything and inspires me. The book itself in this edition is a nice size too.